Neil deGrasse Tyson is known for his excellent research as an astrophysicist, publishing several works on both science and spirituality. While he openly claims to be agnostic, putting most of his faith in the universe, a recent interview may be evidence that he is losing his faith entirely. Tyson has a very scientific mind that looks for evidence-based answers when it comes to spirituality. During the breaking interview, Tyson mentioned a wide range of natural disasters that could make life downright miserable for some people. Hurricanes, earthquakes, volcanoes, and diseases can make life on Earth incredibly hard to deal with. While this may seem like a man denouncing his faith, it couldn’t be farther from the truth. Tyson is simply pointing out that there is no evidence of a creator. He later mentions that should science find this evidence, it isn’t an issue. This is simply where science stands as of now. Tyson goes on to explain that religions are referred to as faiths because they often lack scientific evidence to back them up. This doesn’t mean that they are wrong, just that a person is trusting a philosophy or concept to be right. 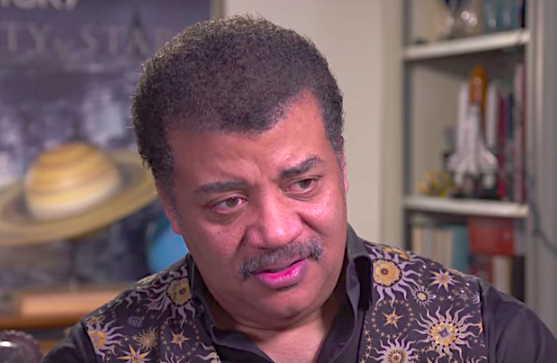 If the religion had solid proof of a benevolent God, they would be called “evidence” rather than “faith.” Instead of looking to stories for answers, Tyson is encouraging people to look for the scientific evidence in the world around them.